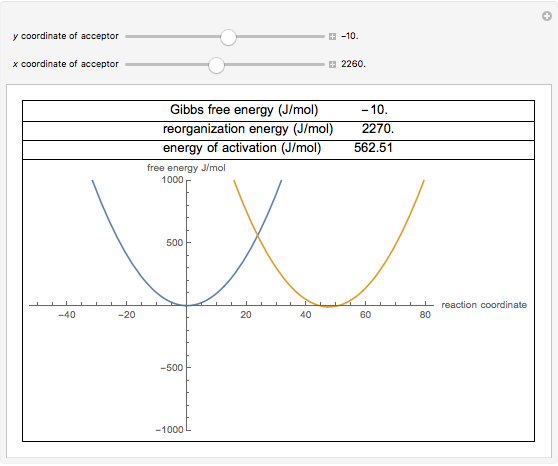 The theory proposed by R. A. Marcus in 1956 [1–3] provides a method to calculate the activation energy of a reaction by using a parabolic model to calculate activation energy. We can graph two parabolas, as a simplified representation of reactant and product energy surfaces, then numerically obtain values for reorganization energy and change in Gibbs free energy from the graphical model. These two values can then be used to calculate activation energy. Once activation energy is known, it can be substituted into the Arrhenius or Eyring equation to calculate a rate constant for an electron-transfer reaction. N. Woodbury. 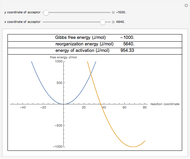 "The Marcus Theory of Electron Transfer." (Dec 8, 2017) www.public.asu.edu/~laserweb/woodbury/classes/chm341/lecture_set8/The%20 Marcus %20 Theory %20 of %20 Electron %20 Transfer.pdf. A. Tokmakoff. "Morse Oscillator." (Dec 8, 2017) tdqms.uchicago.edu/sites/tdqms.uchicago.edu/files/uploads/ReferenceMaterial/Morse%20 Oscillator.pdf. V. Shurtleff. "A Very Brief Introduction to the Concepts of Marcus Theory." (Dec 8, 2017) www.princeton.edu/chemistry/macmillan/group-meetings/VWS-Marcus.pdf. Sherwin Navaz "Marcus Theory of Electron-Transfer Reactions"